Hidden Valley Backhoe & Trucking, Inc. is San Diego's best choice for concrete and asphalt demolition. Over the last 18 years, we've successfully demolished and removed buildings (up to 3 stories high), patios, roads, foundations, pools, septic tanks, parking lots, and more. Our demolition services are ideal for preparing land for new construction and remodeling projects. By working with our team of experts, you'll have your site cleared safely, efficiently, and cost effectively. As a testament to our exceptional service and fair prices, we have thousands of satisfied clients and receive more than a third of our business from customer referrals. At Hidden Valley Backhoe & Trucking, Inc., all of our employees have a minimum of 15 years of experience working in construction and are highly skilled at all aspects of concrete and asphalt demolition, including structural and buried substructure demolition. In addition to breaking, cutting, and removing your concrete and asphalt structures, we can also clear your land. We provide comprehensive grubbing (removal of organic material, such as trees, crabgrass, and weeds), junk removal, and hauling services. For properties in San Diego County and surrounding areas, we offer two options for pool demolition and removal. One option involves poking holes in the bottom of the pool, breaking down the sides a few feet, and filling it with dirt. While this is our least expensive option, it doesn't allow for anything beyond putting in grass or maybe a small patio. The other option is to remove the whole pool. This involves cutting away and removing all concrete and steel, importing fill dirt, backfilling the hole, and soil compaction. This is the option you'll need if you are looking to build a room addition, guest house, or other structure. 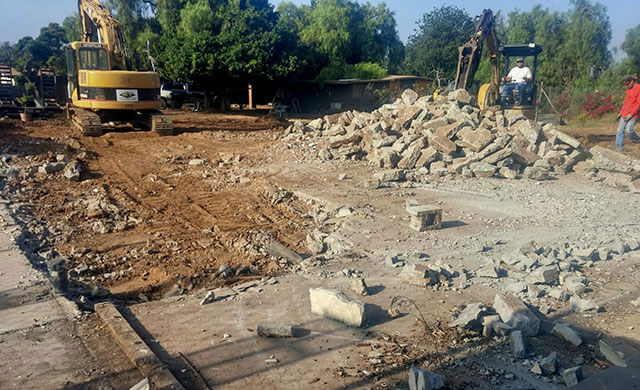 Call today to learn more about our demolition, land clearing, and hauling services in San Diego. We offer free on-site consultations and upfront written estimates. 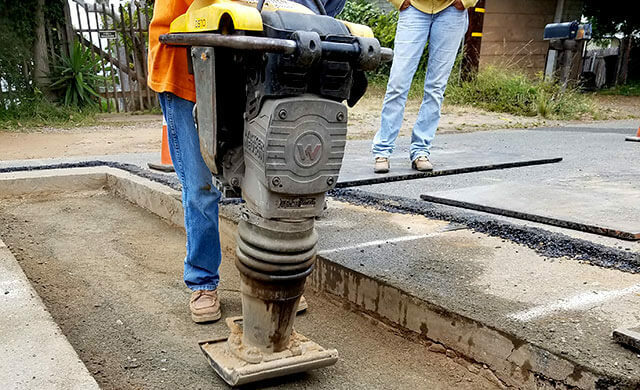 We're a fully licensed and insured Class A general engineering contractor, which means that we're also qualified to perform excavation, grading, trenching, underground pipe laying, backfilling, soil compaction, asphalt paving, and concrete flatwork/repairs. My husband and I recently bought a house. The house was great...the back yard, not so much. The ground wasn't level, there was a random dirt mound in the center of the yard, the yard slanted towards the house (ie water would drain at the house's foundation...never good! ), and there's a large . . .